I had a busy Saturday with my boyfriend! We headed to farmer's market to check out some vegan skin care (more coming in the weeks to come! ), hit up a yard sale, Earth Day at the park where we passed out fliers for the upcoming bake sale, tried having our favorite down town lunch to only find out it was closed so we split a small smoothie from Jamba Juice, mailed tons of stuff out, shopped, had a quick dinner and shot a music video in the back yard. Wow - right? We hit up a yard sale with tons of strawberry things - I love strawberries but was limited on cash. 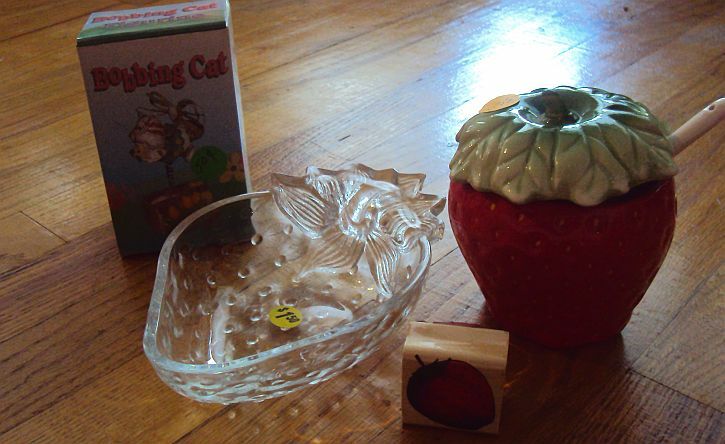 I bought a ceramic sugar bowl with spoon, a crystal candy dish, a rubber stamp and a Spring time cat to leave at the cemetery for my sister. $5.50 for the lot! I love bargains! 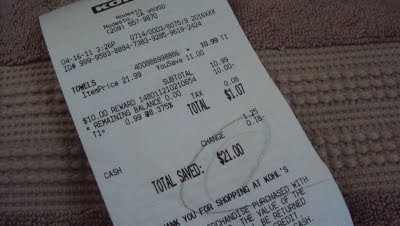 I got the $21.99 bamboo Vera Wang towel at Kohl's for $1.07! I clip coupons - I am not ashamed of it! I hope everyone is having a fun weekend! I have yard work to do and grocery shopping! I could really use a nap!